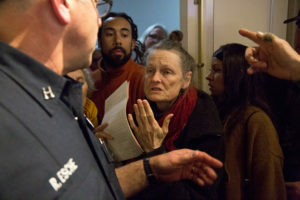 Over 200 community members and leaders gathered at City Hall on Tuesday night, and filled the room to maximum occupancy while others sat outside and viewed the meeting through glass windows or watched from other rooms via livestream broadcasting. 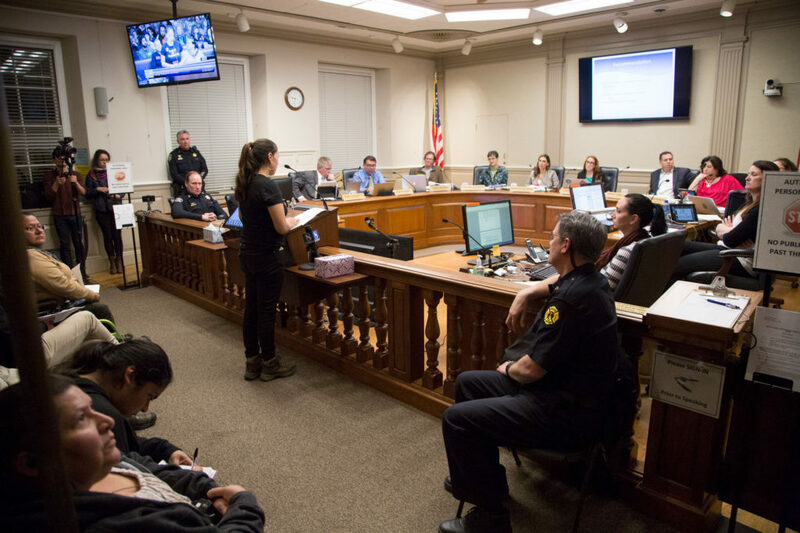 Santa Cruz City Council ruled unanimously to move forward with implementing a “sanctuary” ordinance to restrict local law enforcement and other departments, from cooperating with federal immigration agencies. 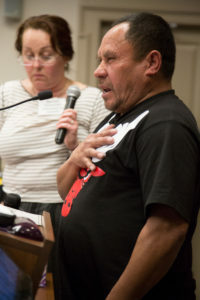 About 30 individuals addressed the City Council in public comment, most of them demanding a more strongly worded ordinance and transparency from the Santa Cruz Police Department (SCPD) about collaborating with federal immigration agencies. Many came to hear what City Council members, SCPD Chief Kevin Vogel and Deputy Chief Dan Flippo had to say about the sanctuary ordinance and the recent raids that occurred in early February in collaboration with Department of Homeland Security (DHS). During a presentation to the public and City Council, Vogel and Flippo were unable to give a clear account of exactly what happened during the raid. They said 20 or 21 individuals total were arrested, 10 of which were detained or arrested for immigration-related reasons, Flippo said. Five of the 10 detained for immigration-related causes were released with GPS monitoring. Vogel said SCPD was entirely unaware of immigration-related arrests until a community member brought it to its attention and further questioning of DHS. ICE spokesperson for the San Francisco field office James Schwab maintains SCPD clearly understood the operation prior to Feb. 13. “Allegations that the agency secretly planned an immigration enforcement action in hopes there would be new political leadership that would allow for an alleged ‘secret’ operation to take place are completely false, reckless and disturbing,” he said in a press release. Because there are still many questions left unanswered by SCPD and DHS ­— like which agency was fully in charge of the operation, whether or not SCPD knew about immigration-related arrests prior to the operation and why local law enforcement partnered with DHS in the first place — the public demanded transparency. Nearly every community member who spoke expressed a sense of betrayal by SCPD. Some referred to the arrests as “forced disappearances” and demanded more than a sanctuary resolution or an ordinance. The public called upon local law enforcement to rebuild trust by talking to community members, particularly those affected by the raid. Many also demanded SCPD to not only denounce any future collaboration with federal immigration agents, but defend community members from being deported. The next City Council meeting is scheduled for March 14 to discuss next steps in implementing the ordinance.